Nails by Tinessa Dixon, Michaels Styles, Cleveland, Tenn.
1. Polish the nail with OPI Dear Santa. 2. Use a white striper to create a basic snowflake. Add a V-shape toward the end of each line. 3. 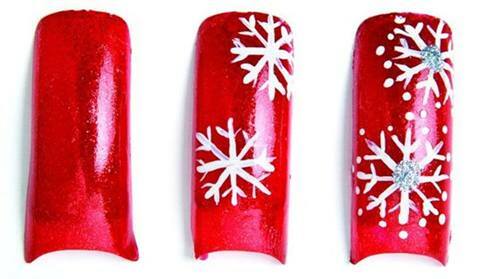 Use a dotting tool to add white dots at the end of each of the snowflakes’ tips. Use a silver glitter striper to accent centers. Apply top coat.